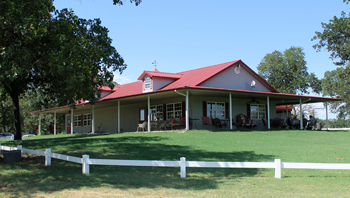 Established in the 1920s, the Henryetta Golf Course is a 9-hole public and private course that offers fun and challenge for participants no matter what their skill level or age. The course was one of the early works of famed national golf course designer Perry Duke Maxwell. The 3,018-yard course has a variety of fairways ranging from long and straight to sharp turns. It has a course rating of 68.8 and a slope rating of 111. 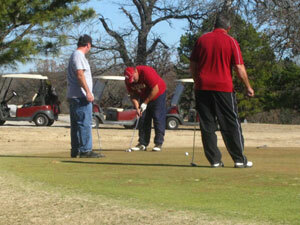 The course is open year-round and usually does not require advance tee-time reservations. 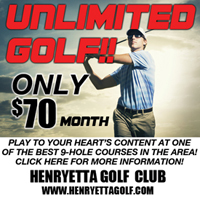 Throughout the year, several tournaments are held at the course so a phone call to (918) 652-8664 could be made in order not to miss out on a day of fun in Henryetta. There is a driving range at the course so golfers can practice before hitting the fairways and club memberships are available at an easily affordable fee. Drive one mile down Main Street then turn left onto the Lake Road and go a couple of miles south. Follow the signs and you will be at the golf course and wonder why you haven't made this a regular stop in the past.